Our friends at @mmydrinks have been coming up with innovative campaigns highlighting particular recipes or categories, sharing the best of the best with the drinking community. After last year's successful run featuring the Last Word Cocktail, this time it was Amaro's chance to take the spotlight. Amaro which stands for bitter in good ol' Italian, refers to the category of digestif herbal liqueurs, which often display a sweetness that can be used to effortlessly create cocktail recipes without trying too hard. As this campaign so effortlessly highlighted, these bottles have a pretty wide range so each one opens up a ton of possibilities. In Los Angeles, Amari have always soared well with local bars and restaurants. Some, who take Amari very seriously, carry several different types, from all corners of Italy and beyond. So as we celebrate the conclusion of Amaro Week this weekend, here are 3 different option to enjoy the beloved aperitivo right here in Los Angeles, right now. Ryan Wainwright remains at the original Terrine location, where he continues to impress with an inspiring new list of cocktails, many of them highlighting Italian notes and The Ponte's incredible menu. The brunch drink options are super refreshing, and often scream “Summer in Italy” with plenty of bitter orange Amari and citrus to cut through the late Summer heat. A grapefruit forward refreshing bubbly with notes of elderflower and bergamot. Ryan keeps a top with the latest trends in cocktails like the newly introduced Italicus liqueur, who recently won Best New Spirit at Tales of the Cocktail. The Edmon is a modern American restaurant set in the beautiful 1927 Art Deco marvel, the Hollywood Historic Hotel. 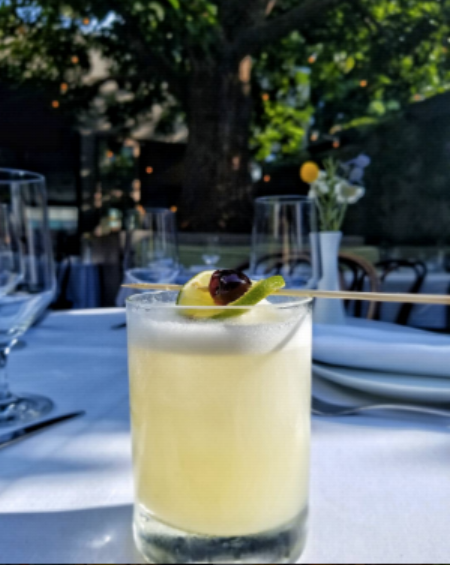 Located next to Paramount Studios, this hotel restaurant/bar feels like old LA with an innovative touch, the cocktails have some serious punch and feature top shelf spirits like Aviation Gin and Whistle Pig Whiskey. Smooth Aviation gin sweetened with earl grey honey and herbal Amaro Monte. It's the classic gin/honey/lemon cocktail, sweetened with the herbal Amaro Monte's finish and a distinctive Earl Grey floral note which complements Aviation quite well. Served in a beautifully chilled coupe. This year, Nerano said goodbye to our friend William Perbellini, who set sail to begin a new journey in Austin, TX. His legacy stands tall at Nerano, the Beverly Hills Italian spin off from the folks at Toscana and Bar Toscana. Barrel-Aged-Knob Creek Rye, Amaro Nonino, Barrel-Aged bitters, Lucid Absinthe served over a ‘Perfect’ Ice Sphere. As an early adopter of all great Italian things, William added a little piece of his homeland to the Italian Sazerac. This is not your typical Sazerac but rather, a Rye whiskey cocktail sweetened with grappa-based Amaro Montenegro, laced with Absinthe and served over a perfect ice sphere. This classic is arguably the first cocktail ever created, credited to Antoine Peychaud who mixed water, sugar, and bitters as a tonic in New Orleans in the early 19th Century. The Nerano staff nailed the Amaro variation every, single time! Truth is, Amaro drinks can now be found in every menu in town. These are 3 recipes we plan to taste going into this weekend. More importantly, though what Amaro drinks will you be drinking to celebrate Amaro Week?